Far too many small businesses put themselves at risk because they don’t understand the real threats of cyber security. There are quite a few cyber security risks that are accepted as fact, opening up IT networks to hackers and large-scale data loss. 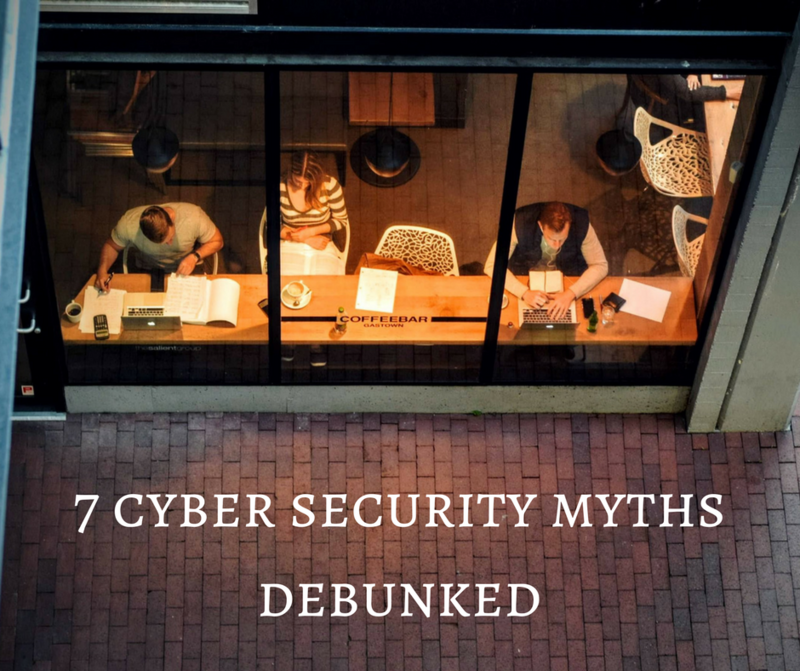 We put 7 of these common cyber security myths to bed so that you can decrease the chances of an attack and mitigate the damage. You may think that as a small business your data isn’t valuable enough to become the target of a malicious hacker, but often the very fact that you’re small puts you at higher risk. Hackers know that small businesses invest less in IT security, making you an easy target. The California-based toy company Rokenbock Education learned this the hard way. During the 2015 holiday shopping season, their database files became infected with malware and in just two days, the company lost thousands of dollars. Although some IT security platforms are too costly for small businesses, there are affordable options that will keep you protected and prevent a large-scale disaster like this one. Anti-virus and anti-malware software can help prevent a cyber attack, but some malware can go undetected by this software until the damage is already done. This is why it’s important to have a qualified IT team constantly monitoring your network and a disaster recovery plan in place. By emptying your trash or recycle bin you’re telling your hard drive that it may write over those files when it needs the space. Before these files are written over, however, these “deleted” files are still easily accessible with a variety of free data recovery tools. This is great news for your business if you accidentally delete some really important data, but it’s also great news for hackers. If you want to ensure that no one has access to your deleted files, you need to completely wipe the free space from your hard drive. You can do this with one of several free tools that cleans your hard drive while protecting your privacy. Google Chrome’s Incognito mode and Microsoft’s InPrivate mode actually aren’t all that private. While they do protect you from other people using your computer, they don’t protect you from the rest of the internet. Your internet service provider and the websites you visit can still record your activity in these private browsing modes. Also, if you log into your Google Account while using Incognito, your web searches will still be saved in your web history. Basically, all Incognito and other private browsing modes do is prevent your Internet browser from saving your recent web activity. What it comes down to is if you’re worried about your employer, or the owner of the computer, finding out about certain online activity, the best solution is to only use your personal computer for that activity. It’s definitely a good idea to protect your wireless network with a password, but public Wi-Fi networks offered by coffee shops, hotels, libraries, and other public spaces are not fully protected. Keep in mind, hackers may also use these establishments and can just as easily request the password and gain access to the network. This doesn’t mean that you should never use public Wi-Fi again, but you may want to think twice while using these networks before shopping online or performing any other activity that provides cybercriminals with sensitive information that could put you or your business at risk. You can also take the extra precaution of turning off file sharing programs, such as File Transfer Protocol (FTP) or Peer to Peer (P2P) File Sharing when using public Wi-Fi. Unfortunately, you can’t always trust that comforting little padlock symbol that many sites now have to the left of their URL. You can trust that it means the data sent between your computer and that site is encrypted, but it's not a guarantee that the site is free from malware or even that you can trust the site to securely store your personal information. This shouldn’t scare you off entirely from online shopping or from entering your email address in exchange for a free ebook or ecourse. You should, however, always be a wary consumer and guard your personal and financial information carefully. Make sure that all your credit cards are set up to alert you in the case of unusual activity and make a habit of periodically checking your accounts to check for unauthorized charges. When a site asks for more than your first name and email address, make sure that it’s a site you know and trust before willingly sharing that information. Complete data security actually isn’t feasible if you still want access to your data. The issue is that as security protections increase, your ability to access and use the system decreases. The CSO blog gives a great example of this: In order to achieve 100 percent security on your smartphone, you have to put the phone into airplane mode and lock away the phone in a safe. Your phone may now be entirely safe from hackers but the phone has become completely useless to you, so what’s the point? It’s better to aim for reasonable and effective cyber security that doesn’t sacrifice usability of your data and/or system. A clear understanding of cyber security—what are the threats and how you can mitigate the risk—can be one of the best preventive measures against cyber criminals. Small businesses should not have to shoulder this responsibility on their own, however, as cyber security is constantly evolving and without a dedicated IT team, it can be hard to stay up to date. Check out our previous blog post for more tips on how to protect and grow your small business online.